Posted: March 2, 2018 1:30 p.m.
(l-r) Dr. Nick Carleton, Professor of Psychology and Scientific Director of the Canadian Institute of Public Safety Research and Treatment at the U of R, Mayor Michael Fougere, City of Regina, Honourable Ralph Goodale, Minister of Public Safety and Emergency Preparedness, and Dr. Vianne Timmons, President and Vice-Chancellor, U of R. Photo courtesy Michael Bell Photography. 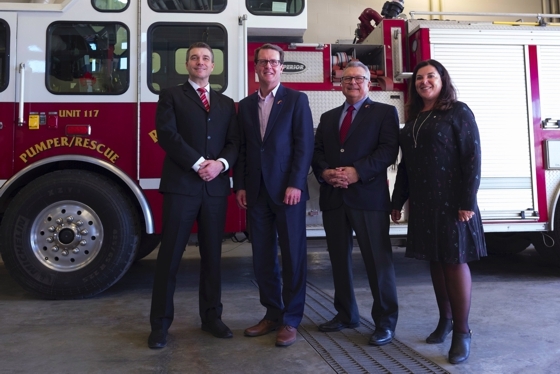 The University of Regina’s Canadian Institute for Public Safety Research and Treatment (CIPSRT) is leading a pan-Canadian consortium that is receiving $30 million over 5 years from the federal government to address first responders’ and public safety personnel’s mental health concerns. 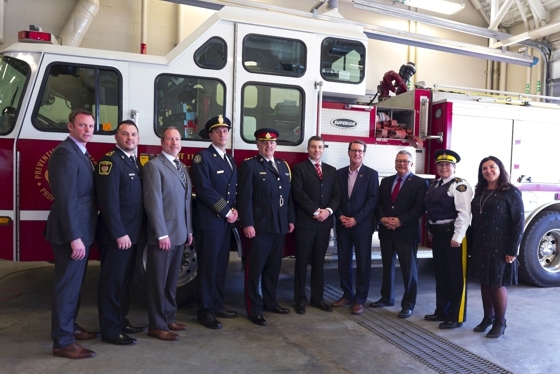 Public safety personnel with Dr. Carleton, Mayor Fougere, Minister Goodale, and President Timmons at # 4 Fire Station for today's funding announcement. • $20 million over five years, beginning in 2018-19, to support a new national research consortium between the Canadian Institutes of Health Research and CIPSRT. This new consortium will work to address the incidence of post-traumatic stress injuries among public safety personnel. • $10 million over 5 years, starting in 2018-19, for Public Safety Canada to work with CIPSRT to develop an Internet-based Cognitive Behavioural Therapy pilot as a means of providing greater access to care and treatment for public safety personnel across Canada. This will help address barriers to obtaining access to mental health supports for public safety personnel in rural and remote areas. Partnering with public safety personnel’s executives and associations, CIPSRT is a national network working with key stakeholders on a long-term initiative to identify the tools required to support the recognition, prevention, intervention, and treatment of mental health concerns facing Canadian first responders and other public safety personnel. Operating within the governance structure of the Collaborative Centre for Justice and Safety at the University of Regina, CIPSRT is a coast-to-coast multi-university team of top Canadian researchers working at Regina, Memorial, Wilfrid Laurier, and Queen's universities, the Justice Institute of British Columbia, along with many national partners, stakeholders, and academic colleagues from across Canada.